Having a powerful security product on your beloved computer is a must-have. Especially nowadays, when there are so many malicious threats which put it at risk. Your device, however, won’t be the only one affected if it doesn’t run an excellent antivirus. You’ll also put your life at risk, considering just how much important stuff you keep on your computer, tablet or smartphone. The next time you buy one of the latter, make sure it comes with strong security software. If it doesn’t, look for one online and grab it. BullGuard is a Danish company that specializes in security solutions. They’ve been around since 2002, which means 15 years of creating antivirus products and finding new ways to improve them. The Danish company may have started small, but the team behind it made it into one of the most popular names in the industry. All thanks to the great security solutions they’ve offered along the years. Some of the company’s best known products are BullGuard Antivirus, Internet Security, Spam Filter and many others. In today’s review we’ll talk about BullGuard Antivirus 2019. We tested this version on our PC and want to share our thoughts about it with you! Every security product you’ll want to install on your favorite device needs certain requirements from it. If you don’t pay attention to them, the gadget you use won’t function properly. The BullGuard Antivirus 2019 is no exception. This version demands 850 MB of hard-drive and 1 GB RAM of memory. The operating system needs to be either Windows Vista , Windows 7, 8/8.1 or Windows 10. The antivirus works with both the 32-bit and the 64-bit of each of these OS versions. Also, make sure you have a good Internet connection. BullGuard also offers support for Mac (OS X 10.11 or later) and Android (4.0 Ice Cream Sandwich or later), but you need the Internet Security software, which is a premium protection package. The installation process for the BullGuard Antivirus won’t slow your PC down. This security solution isn’t going to take an eternity to become one with your device. The installing procedure is very similar to the process described when we reviewed Bitdefender Antivirus Plus and Norton Total Security 2019 – the files are downloaded during install. A Microsoft Visual C++ file is also downloaded if is not already installed on your computer. An interesting feature is that the installation process is also used for a preliminary scan of the computer, a nice capability, which can eventually provide additional protection. Once it’s all settled there, you can start using it and enjoy everything it has to offer. The user interface is very easy to navigate, especially if you’re a beginner with BullGuard. To activate the product, you need to create an online account with them, a feature also similar with Bitdefender and Norton’s security solutions. After the activation, you’ll be able to keep track of everything you need. Compared to other already reviewed security options, the BullGuard 2019 doesn’t have an extensive list of features. The ones it does have, though, are more than enough for an average computer user. We’re talking about Safe Browsing, Spam Filter, Antiphishing Protection and Malware Blocking. 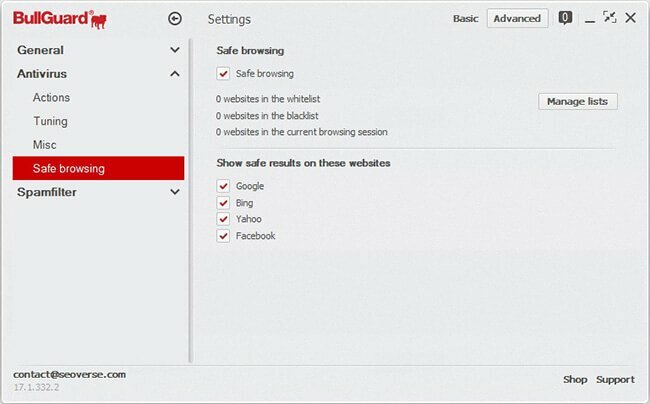 The Safe Browsing feature does a very good job of keeping your device safe against malicious websites. Whenever you click on a certain link you find with Google, the antivirus will display a warning sign. The websites that are safe will have a green checkmark next to them. 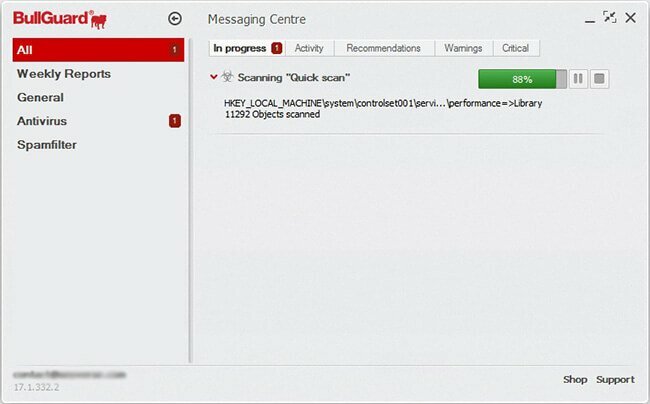 When an infected site is detected, a red message is displayed. You are warned that the site is infected and you’re advised to leave it. Malware Blocking is one of the features that’s strongest with this antivirus. Detection rate for different samples is an impressive 99%. We recorded some of the lowest false alarm rates during our tests. File detection was also very good. 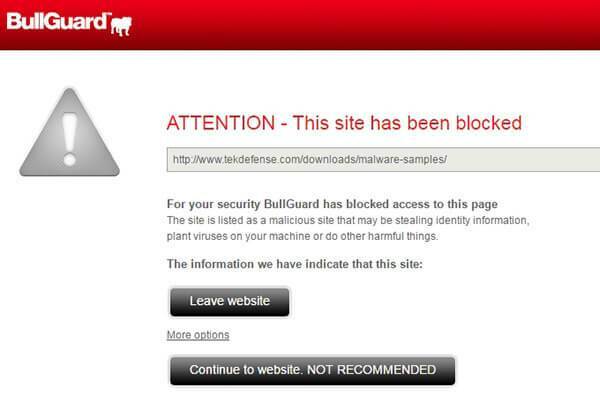 Whenever malicious software is discovered, the latest version of BullGuard Antivirus will remove it quickly. We also tested the Antivirus module against a series of malware to see the speed of reaction and we were really surprised to see that BullGuard is fast and lightweight. As usual, we checked the speed of reaction against the classic EICAR file with very good results. An interesting thing is that the file is recognized as “not a virus”: all the applications tested so far wrongly reported the file as a real threat. 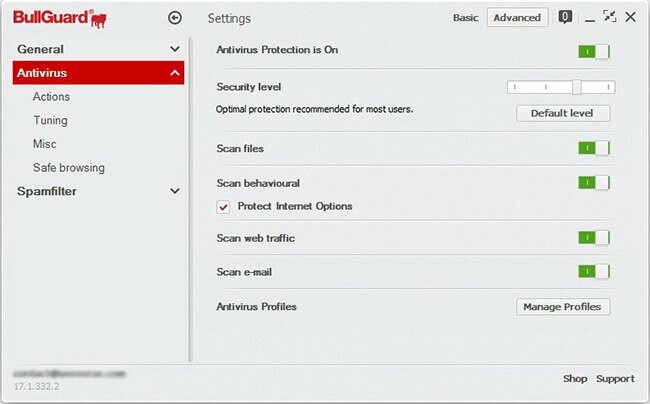 The antivirus module can be configured in various ways and levels of protection. The Internet protection feature can be activated or deactivated from here. Also, you can choose to scan the incoming traffic and all received emails. 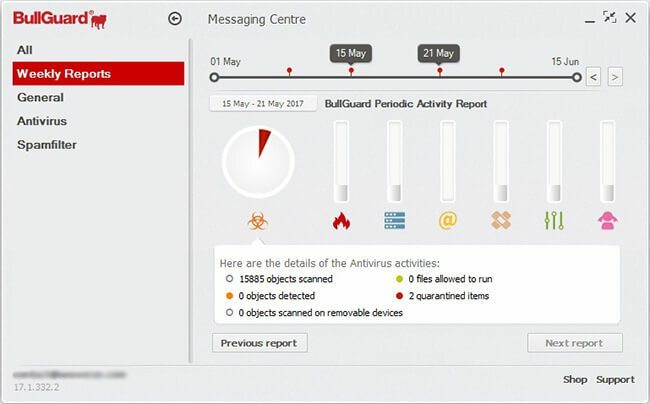 BullGuard Antivirus 2017 comes with heuristic and spyware detection. Both of them can be activated using the same application’s menu. The antivirus’s fine tuning allows tech users to decide if they want to skip some parts when the scans are performed. We advise you to keep this section untouched. For example, if you choose to ignore scanning the files from the local network you may end up being infected with the WannaCry ransomware. This virus acted like a computer worm, using the network to infect the computers. The Antiphishing feature needs some improvement. It’s not bad per se, but you must remember to keep it turned on each time you’re on your favorite website. In case you’ve landed somewhere dangerous, you’ll see a warning screen. Remember the one we mentioned when we discussed the Malware Blocking feature? It looks the same. Spam Filter is the next feature on the list. 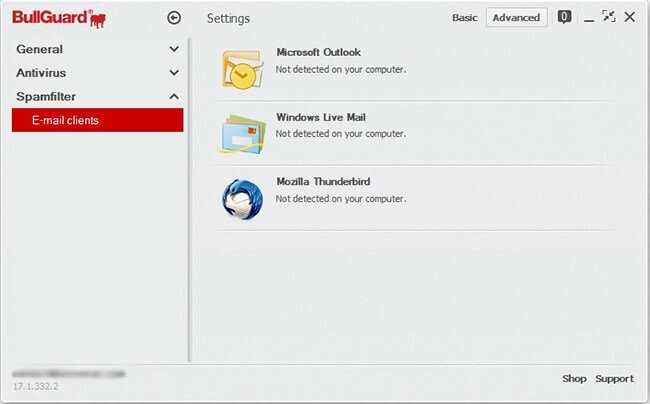 It works with Mozilla Thunderbird, Windows Live Mail and Microsoft Outlook. The filter used by this feature is a Bayesian one. Don’t worry: actual messages aren’t going to disappear into the folder marked Spam. Addresses from people you trust are whitelisted. The Spamfilter can be configured to whitelist the addresses you write to or automatically trust the list of emails used by the trusted senders. 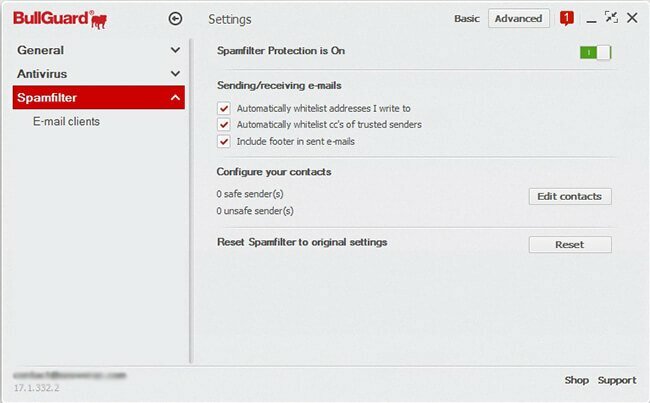 You are also asked if you want to display a message about the protection provided by BullGuard in the emails sent. 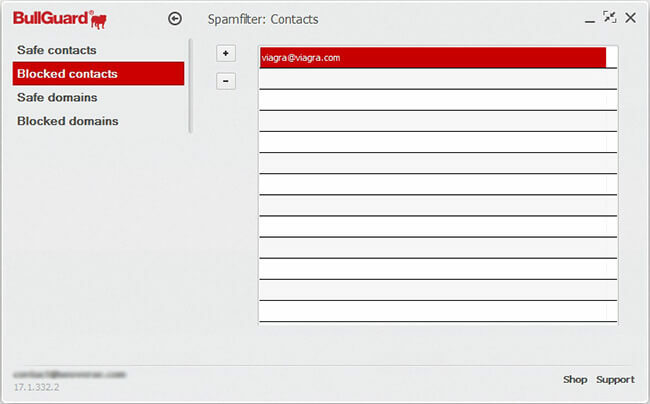 You can manually block the spam contacts if you need to add additional email addresses to this list. The filter may also be used for entire domains because sometimes the spammers simply change the address and you need to re-check the new emails to be able to block them. By using this strategy you’ll make sure the email spam will no longer be a problem for you. Other functionalities are present only in the superior package offered by BullGuard: an Internet Security suite. The latest version of BullGuard Internet Security includes a firewall, a strong Parental Control module, a vulnerability scanner and a PC Tune-up feature. We tested all these featured for this review and we were pleased by the quality of this Internet Security suite. The firewall is strong enough to offer premium protection against network attackers. We simulated a few attacks in a private network and the results were impressive. The attacks were blocked in a matter of seconds and a warning was displayed. To sum up about the firewall module: the latest version of BullGuard Internet Security doesn’t allow hackers to take control of your network or computer. The Parental Control module can limit the access of children to dangerous online resources like adult or violent websites. The module is simple to use and effective: you can add various search filters using keywords or block certain applications installed on the computer. Another feature included is the activity monitoring features, useful if you need to see your children’s online activity. The Vulnerability scanner is very similar to the one provided by Bitdefender but not so effective. You are advised to update your operating system and install the latest drivers in order to repair the vulnerabilities present on your operating system or any problems you may have with the installed applications. The Backup module available in the latest version of BullGuard Internet Security allows you to automatically upload the encrypted files from the Bullguard Cloud directly to the main cloud platforms. We are talking about Google Drive, Dropbox, and One drive. The option is very useful if you want to maintain your most important data safe, backed up in another location. The PC Optimization section could help you if the computer is not very well optimized. Some background processes may be stopped in order to improve the computer’s usage experience. 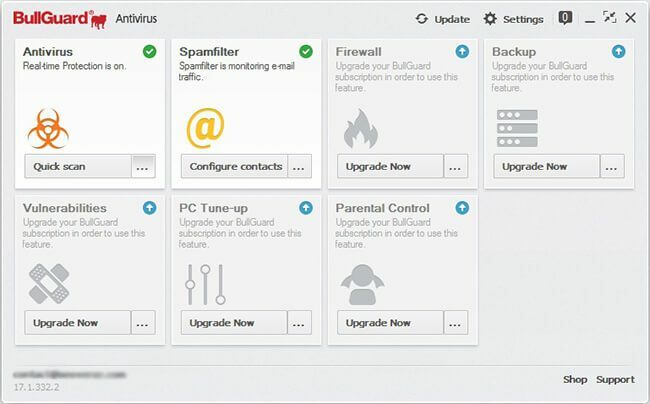 Notice that all these additional features are only available in the BullGuard Internet Security (also tested and reviewed by our team), and not in the Antivirus version. The Weekly reports module is the place where you’ll find the summary of the last week’s Bullguard Antivirus’s activity. You can see the number of objects scanned, the threats found and the number of quarantined files. The report is divided based on the modules: the malware section, the anti-spam area, the Parental Control section, so on… This feature is available for both Bullguard’s Antivirus and Internet Security. 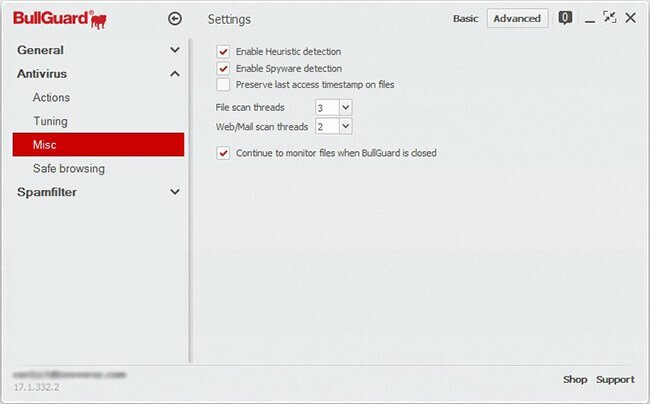 The latest version of BullGuard Antivirus is one of the lightweight antimalware solutions tested by our team. The scanning speed is very good and the impact on system resources is minimal. If you own an old computer and you need a good protection for it, this security software is a very good choice. BullGuard has you fully covered if you’ve got questions about their most recent product. For starters, you can go to their FAQ section. If that doesn’t help, there’s a live chat team you can contact 24/7. You can also email the support team. We tested the reaction speed and of the support team and we were pleased by their professional answers, so you’ll benefit from very good support. Product guides are available, too, as is a forum section. The most recent antivirus created by BullGuard is, like all of their previous products, good value for money. If, however, you want more features and complex protection, we suggest trying other solutions. For those of you who don’t mind fewer options that are nonetheless strong, the BullGuard Antivirus 2019 is a valuable choice. AV-TEST puts several antiviruses through the grinder last year. The BullGuard Antivirus came out as the winner. This goes to show that you can count on the Danish team to keep your device secure. Macworld, ExpertReviews, PC Advisor and many other popular sites think this latest security product is one of the best on the market. BullGuard Internet Security 2019 and their Premium Protection 2019 are two other products you can check out. The first one has all the features of the version we discussed here, but it comes with some good bonus functionalities and complete support for Mac and Android. The main pros and cons of BullGuard Antivirus 2019 are available in the table below. BullGuard Antivirus 2019 is a good choice for those of you who don’t want a complex antivirus. The product is one of the easiest to install and use by everyone. You may get fewer features than competitors’ solutions, but they’re effective. 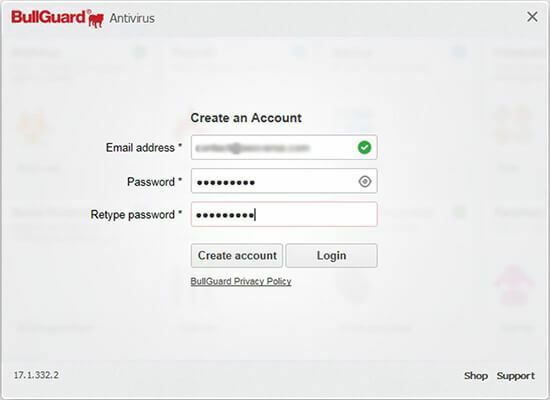 Your computer will be protected against various threats with Bullguard’s latest antivirus. BullGuard Antivirus 2019 is a simple, lightweight and very effective security solution. The BullGuard Antivirus 2019 is up for grabs on their official website. You can get it with a discount code for only $23.96 and protect your device for one year. If you want to have a look at a comparison between Bullguard’s security solutions, have a look here. If you don’t want to pay, get the free trial and test the antivirus over a period of 15 days. The massive increase in cyber attacks has lead to over 5 billion dollars in loss just in the last year. We recommend installing the latest version of Bullguard Antivirus if you want to stay protected and avoid becoming the next victim of hackers everywhere.